The boat, launched December, 2017, was developed by Stanley Aluminum Boats in close cooperation with the Charleston Volunteer Fire and Rescue Squad, which includes first responders, EMTs, and paramedics. It is 31’ overall, powered by twin YAMAHA 250 outboards, and can travel at 44 mph to quickly assist victims who are not within reach of land-based units. Remarkably, it can operate in as little as 20” of water, to facilitate operations under local conditions. Stanley president Bill Connor pioneered the company’s fire rescue designs: “We’re excited, and proud, to also offer this as a combination vessel that can be equipped with a pump for those agencies that need marine fire suppression capabilities. Stanley, which is headquartered in Ontario, Canada, is a division of Connor Industries, which has been building heavy-duty custom commercial boats and recreational boats for three decades. 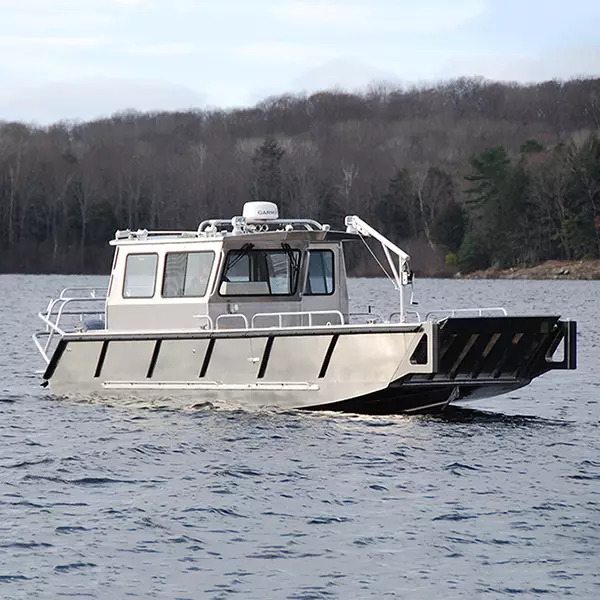 Based on their experiences with extreme weather, the Stanley engineers created a unique wheelhouse design that provides rescuers with protection from the elements, but also provides a ‘fore-and-aft pass-through’ to ease on-board crew movement while underway. The boat is also equipped with dive doors, diver safety rails, push-knees, lifting davit, and a tow-post for maximum utility. It features Stanley’s famous Bullnose® bow gate, 72” wide, to enable crews to retrieve persons or objects from the water, and to load equipment from shore, making Charleston’s boat ‘beachable’. The new boat has a 10’ beam (width) for maximum stability, and comes with a tri-axle trailer for saltwater launches. It is equipped with advanced electronics, carefully selected by the Rescue Squad.